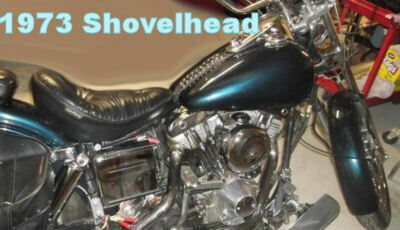 The vintage 1973 Harley Shovelhead for sale has 1200 cc. of power and lots of chrome! There are less than 5,000 miles on the Harley's rebuilt engine. My 1973 Harley Davidson shovelhead is a beauty that has had over $10,000 invested. old Shovels and make price and feature comparisons before deciding if you want to buy. I can supply serious buyers with a complete list of specs and pictures of the vintage Harley Shovelhead for sale upon request. (Please make notice of the fact that these services are for serious buyers only, don't waste the owner's or your own time). Cash money talks and I also might be willing to trade the 1973 Harley Shovelhead for a early model Chevy, Ford or a tent camper trailer of equal value. The Shovel is located in sunny Palmdale near Los Angelea CA California. My asking price for the motorcycle in this classified is a very cheap $11500. Contact me and don't forget to mention that you found this ad on GoGoCycle's Used Motorcycles and Parts for Sale www.gogocycles.com.